In order to shed her baby weight, iconic singer Mariah Carey followed a “Purple Diet.” This diet only includes “lilac produce” such as grapes, certain berries, purple carrots, plums and eggplant. Naturally purple-colored foods contain anthocyanins, powerful antioxidants that may help prevent cell damage. These foods may also lower your blood sugar levels and help you lose weight. But also keep in mind that if you are only eating produce, of course you will likely lose weight. I’m not suggesting you only eat purple produce. This may not be a balanced or sustainable way of eating, but it definitely might not hurt to add more purple produce to your diet, particularly eggplant. 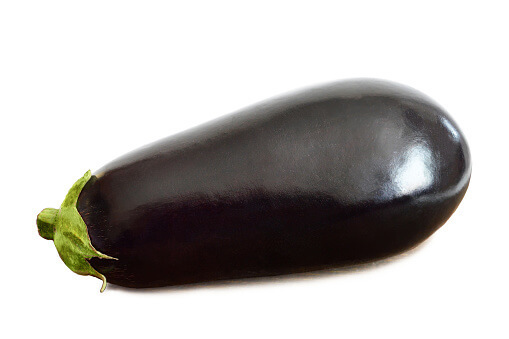 The eggplant belongs to the Solanaceae (more commonly called nightshade) plant family, along with tomatoes, potatoes and bell peppers. Globe (a.k.a American Eggplant): Larger in size, dark purple and pear-shaped. This variety is commonly sold in the United States. Fairy Tale: An heirloom variety that is small in size (usually no bigger than the palm of your hand), has purple and white stripes and is said to be less bitter. Japanese: Purple in color, longer, thinner and more cork-screwed shaped. White: There are multiple varieties of eggplant that have white skin. Is said to taste about the same as the Globe variety. Indian (a.k.a baby eggplant): Small and squat with a dark reddish-purple color. There are practically endless varieties of eggplant. Additional varieties include Thai, Little Green, Bianca, Graffiti, Black Beauty and many more. No matter what variety of eggplant you choose, you may be choosing some great benefits for your health. For example, the National Institutes of Health (NIH) recommends eating eggplant to help manage type 2 diabetes. “The rationale for this suggestion is the high fiber and low soluble carbohydrate content of eggplant. We propose that a more physiologically relevant explanation lies in the phenolic-linked antioxidant activity and alpha-glucosidase inhibitory potential of eggplant which could reduce hyperglycemia-induced pathogenesis,” reports the NIH. Alpha-glucosidase inhibitors are oral anti-diabetic drugs. They help delay the digestion of carbohydrates and as a result lower glucose levels after having a meal. Eggplants are also antioxidant powerhouses. Eat the skin of the eggplant. Trust us! The skin of purple-colored eggplant contains a phytochemical called nasunin. Not only is nasunin a powerful antioxidant that has proven to protect cell membranes from free radical damage, but also one study suggested that nasunin exhibited antiangiogenic activity (meaning it prevents the formation of new blood vessels) and specifically protected brain cell membranes from free radical damage. (Nasunin may also help remove excess iron from the body). Angiogenesis plays a major role in the growth and spread of cancer, because new blood vessels may provide a blood supply that the cancer can live off of. It can also be a contributor to cardiovascular and other types of disease. One cup of cooked eggplant contains 122 mg of potassium. Eggplant also contains chlorogenic acid (also present in coffee), another antioxidant that helps fight free radical damage and inflammation. Chlorogenic acid may also lower blood cholesterol levels and provide antimicrobial and antiviral properties. Pantothenic acid (vitamin B5) is also found in eggplant. Vitamin B5 “helps produce energy by breaking down fats and carbohydrates. It also promotes healthy skin, hair, eyes, and liver,” according to this report. Need help with quitting smoking? Try eggplant. I know this sounds very strange, but credible sources suggest eating eggplant may help smokers quit smoking. Eggplant (and other nightshades) naturally contains small amounts of nicotine. While eating eggplant may not have nearly as much nicotine as a cigarette, the small amounts it does contain may help reduce smoking cravings. One study from a few years ago also found that eating nicotine-containing produce may help lower the risk of developing Parkinson’s disease. So it appears that nicotine in high amounts is very harmful, but small amounts in natural, whole foods may be beneficial. This does not mean that a drag or two from a cigarette is healthy. Remember, cigarettes contain at least 69 chemicals that are known to cause cancer. Eggplant is also low in fat, cholesterol-free and rich in fiber, making it a waist-friendly food. Of course you can’t have eggplant parmesan without eggplant. And although delicious, this dish can be fattening. You also do not want to overcook eggplant. Simply steaming it for a side dish is a great way to preserve the antioxidant content. Baba ganoush is a simple, delicious and healthy dip that contains eggplant (usually roasted), popular in Mediterranean cuisine. Make some for the next party you host. 1/3 cup tahini from light seeds, not "dark tahini"
Some people may also add kalamata olives for a bit more flavor. Plants in the nightshade family contain an alkaloid called solanine, which in large doses may be poisonous. But reportedly, you would need to eat about 36 raw eggplants to be poisoned. If you have kidney stones, consult your doctor about eating eggplant. Eggplant contains oxalates, which may contribute to kidney stone formation. And since nasunin, which may remove excess iron from the body, is found in eggplant, people with low iron levels also should consult a competent healthcare professional. Some reports say that the solanine in eggplant may cause inflammation and trigger painful arthritis symptoms, but eggplant also has anti-inflammatory properties, so speak with your doctor. If he or she gives you the green light to eat eggplant, see how your body reacts. And as always, if you are pregnant, taking any medications or have any existing health conditions, consult a doctor before consuming eggplant.